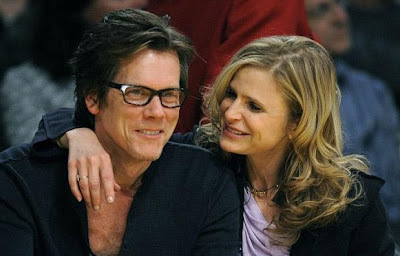 There are many fantastic body language displays in this interview, but one in particular is highlighted here: At the 0:37 mark in this video, just after she sees a video of her husband (Kevin Bacon) describing their first encounter and their love, Kyra Sedgwick briefly touches her sternum with her right (dominant) hand. When we further nuance her body language however, we see that she makes contact not only with her fingers - but with the palm of her hand as well. This "palmar touch" indicates a much greater level of sincerity. When anyone touches with just the fingers/finger tips (such as often seen in business, sales, the courtroom and in personal relationships) - this indicates insincerity. Such a MAP (Manipulator, Adaptor or Pacifier) display would not indicate the person as a whole was insincere, but it would mean in that moment, they were not feeling full commitment and/or not being entirely honest (unless of course we see such nonverbals displayed chronically). Touching over the upper left chest or over the sternum, particularly with one's dominant hand indicates even higher levels of the "Heart-Felt" emotions of love and affection. Analysis # 2053: Strong Signal of Fear-Sadness Anxiety - Aurora, Colorado "Batman Shooting"